When I cut out kits for my Etsy shop (or in this case for Etsy and the upcoming retreat) I like to cut out as many kits as possible at once. Since I make such a mess in my sewing room when I make kits I might as well go all out and pull every stack of fabric off my shelves, right? Tonight when I'm sorta finished I'll clean my sewing room and watch an old movie while I work. My favorite channels are the 4 old movie channels on our dish. LMN, AMC, TMC and FMC. Don't ask me what the letters stand for. Right now I have "Return to Payton Place", "Pocket full of Miracles", "National Velvet" and "Double Indemnity" taped. I suppose I'll watch one of those. Now back to fabric. Sorry, I got off track there. Below are some fabrics I pulled today to cut into kits. I won't show you the mess I've made doing all this, however. 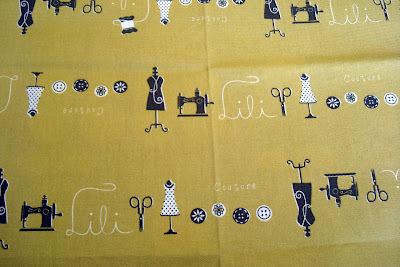 Sewing room goodies - this is a thick cotton with a deep golden yellow and black. I love fabric with letters and writing on it. This is kind of a turn of the century newspaper print. 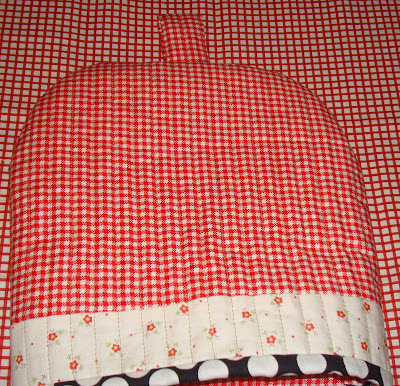 I know not everyone likes good old Sunbonnet Sue (Flora). But I just love her. This is cute, no? 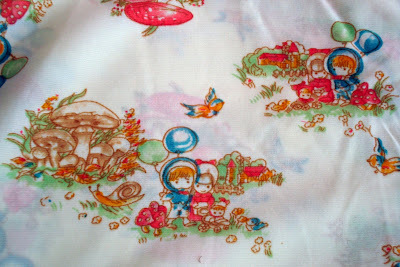 I also really like fabric that has several prints on it. I feel like I'm getting more I guess. This juvenile print gives so much to enjoy. 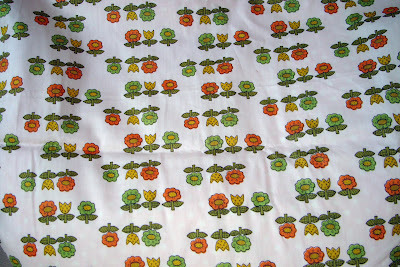 Here is another one of the thick cotton fabrics in vintage style via Japan. Some of the things they write are hilarious as they try to coin our phrases. I really love the colors in this vintage print. Again - lots of different prints wrapped up into one. More thick cotton/linen fabric of many different images. 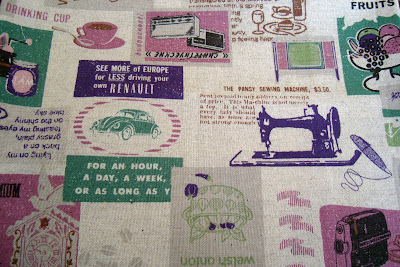 I'm a sucker for sewing machine prints. I've had this large scale reproduction print for a while. I love the 60's colors. Avocado green, powder blue, rusty orange and gold. I think this vintage gingham has some polyester in it. It kind of feels like one of the vintage sheetings. I like the scale and I think the billy goats are hilarious. And last is the Christmas scene that Flora brought me. I am going to copy her idea from her cottage flimsy in my last post. Isn't this adorable? And so perfect for the cottages. Seriously? What would I do without Flora? Thank you. Speaking of the cottages - look at how Sarah has her cottages arranged on her design board in her wonderful new sewing room. Scroll down. I love the sashing. I'm going to copy that, too. 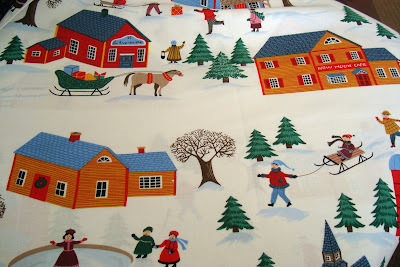 A mix of Flora and Sarah will be just perfect for my 2nd Christmas Cottage quilt. Now go visit Amy. 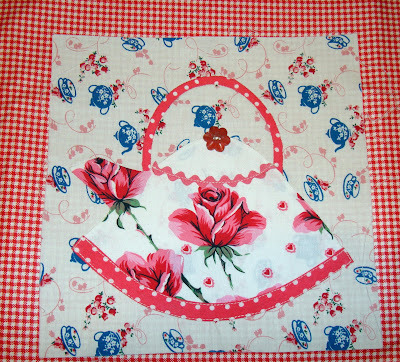 She recently sewed and quilted a wonderful bag from my "Mixed Bag to Quilt" pattern. It is fabulous. Love the orange. Happy Weekend all. I don't plan on getting much sewing accomplished. Too many tasks on my "to do" list this weekend. 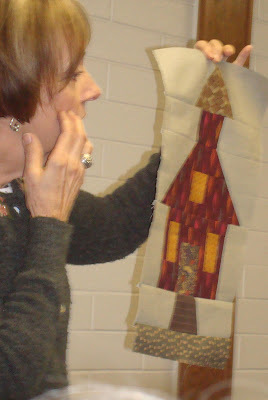 Kim has her pics from quilt nite up. Go see them at Bitty Bits and Pieces. She was in a much better place in the room and SHE had battery power! Tuesday night was quilt night. It is always a treat. 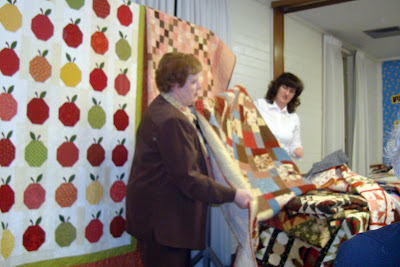 It was wall to wall super talented quilters. So fun. I nearly missed it but that is another story. Here is the fantastic Flora, our fearless leader. 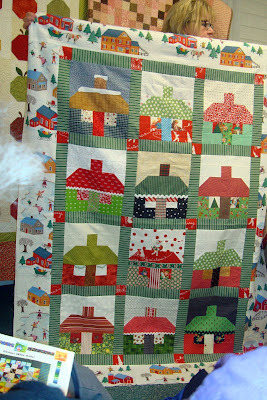 She was in our Christmas Cottage swap and look - she has her flimsy done! Isn't it amazing. I absolutely love her border fabric. It is perfect and she sashed with posts. Flora had a surprise planned for me. It was kind of embarrassing but extremely sweet. Thank you Flora. More about that another month. My camera batteries died so I didn't get pictures of that or lots of other other great stuff shown. 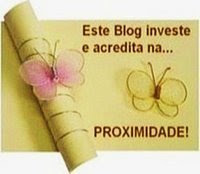 You'll have to go to Kim's blog. I hope she posts pictures soon. She took a bunch. Hint hint Kim. 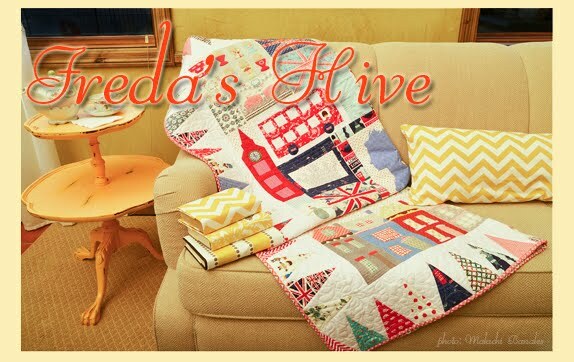 Here is the famous Judy - supporting star player in Nedra's blog. 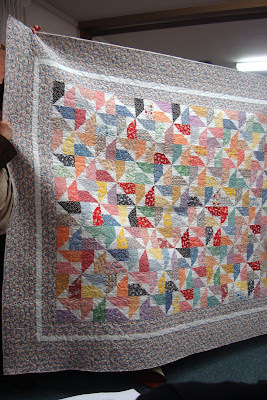 Isn't this quilt flimsy beautiful. I love it Judy! It has such motion and life. I can't wait to see it quilted. Another wonderful quilt. 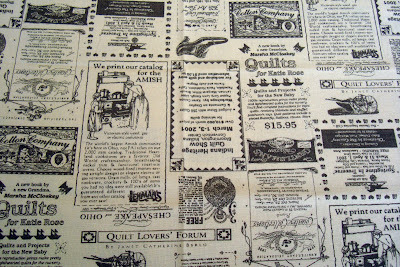 I love lively quilts. They inspire me. And of course I love the scrappiness. Sweet hearts. I love the shape of a heart. And who doesn't love red, pink and white? 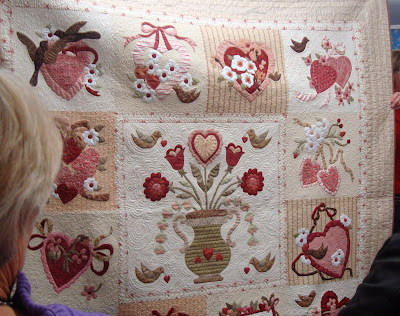 This valentine applique quilt is so elegant with great technique. Look at all that handwork. The quilting is amazing on it too. I was glad that I at least had enough battery power saved to take a picture of our 2 lovely guest speakers. Sharon and Nadine did a great job. 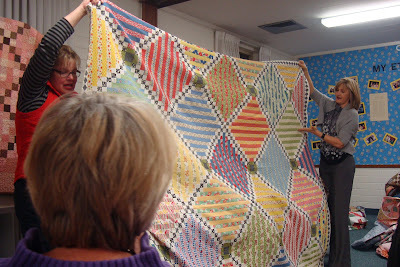 They had terrific quilts and it was fun to hear their story. Sharon works at a great local quilt shop, American Quilting, so I get to see her now and then. Thanks ladies. Can you believe we each went home with one these! A very generous member of our quilt group brought one of these lap boards for ALL OF US! There had to be 60+ women there. They were made by her husband. And made very well, too. I felt like I was in Oprah's audience. This is definitely going to be one of my favorite things. Next month I make sure the battery in my camera is fully charged. I missed some great picture opportunities. Even though I have lists and lists of things to finish/do, sometimes I just want to create something new and sew for pleasure. I think you can probably understand that feeling. 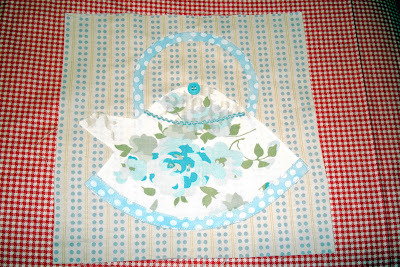 So I've been having a fun time with my new applique design and making teapot after teapot. This green check one from vintage gingham (thanks Eileen!) is my favorite I think. I love to fussy cut and embellish. But you know that already don't you. I'm so predictable. 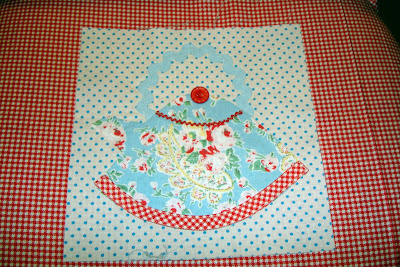 I've had this blue sorta shabby chic fabric for some time but putting red with it kind of makes it my own style. I enjoyed making some of the teapots with rick rack handles. And you've seen this one. Thanks for the suggestions of blanket stitching around it. I had thought of that, too. But I think until I decide what I'm going to do with these blocks, I'll hold off on making up my mind about it. I know I don't show blue that much on my blog but I've been drawn to it lately (and in case you didn't notice 3 out of 5 of these teapots have roses on them, and I didn't even realize that until just now). This blue rose gets notched up a bit when partnered with the blue dot I think. When I went to Broadbent's over the weekend I bought a narrower bias maker (those wonderful Clover brand) in 1/4" size so I was able to create this handle much easier than the first block I made. This apple teapot isn't finished yet. I enjoy gazing at the work in progress and deciding where I want to go with it. I am in my "zone" when I'm working with fabrics and new ideas. I don't often blog about very personal subjects like my church, but everyone, regardless of religious or social beliefs can relate to many of the profound statements in his talk. I have listened to it and read it many times. It inspires me and even makes me feel like what I do is important. If you have a moment or two, I urge you to read it. He has a great way with words. Edit - I almost forgot - go see Kim at Bitty Bits and Pieces blog. She's having a wonderful valentine givewaway with the sweetest little bag and valentine fabric pieces. It is to celebrate her 100th post. So cute - gosay hi. 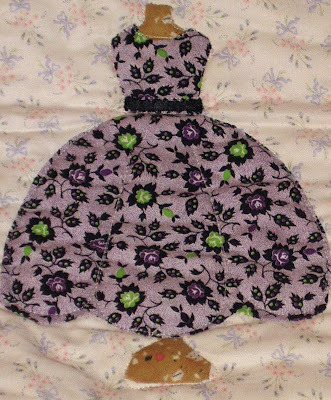 And then go visit Betsy at Quilting Fiesta and see her sweet "All Dressed Up" applique! It is so darling. Her granddaughter will love the quilt. I worked on several projects over the weekend and among them was the teapot block from Pink Penguin's tutorial. Ayumi has very generously made the template for the patten available through her blog. I think I'm a fair sewer/quilter overall, but paper piecing is really not my strong point. You'll notice my lid is a little off. And I took liberties to simplify the lid/top some. I guess that is typical of me. The fabric combination turned out nice though. I decided to make the block into a little tea cozy. So I added fabric to the sides and bottom and rounded off the edges before quilting it. Unfortunately the dimensions I used were kind of from a smallish teapot so I'm not even sure how practical this would be. But it is cute I think. Certainly not my best work, but charming. A view from the back, sorta (if I hadn't lopped off the bottom when I cropped the pic). 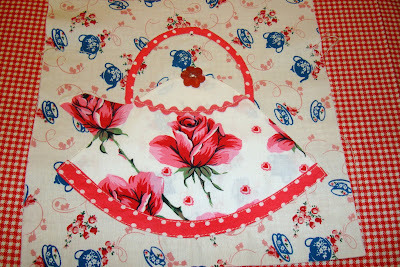 That little red flower print from Mary Englebreit's "Baskets of Flowers" line is really sweet isn't it? I can think of lots of projects it would enhance. I think I "need" more than the fat quarter I got at Broadbent's. I really like this same print in the pink background colorway, too. You can see it here. They are all quite lovely. 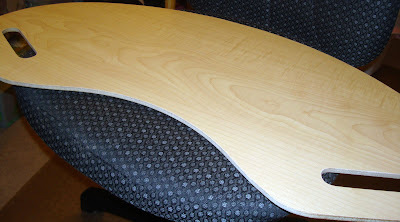 Now that I think about it I wish I had more of this big dot too (in other colors), it makes great binding. Oh well, they'll make more. They always do. Never underestimate the power of contrast in fabrics. I seem to have to relearn this over and over. 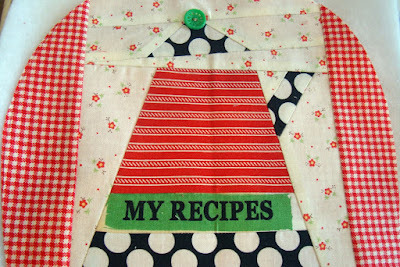 Notice how nicely the teapot/teacup print and the red check contrast and enhance each other. 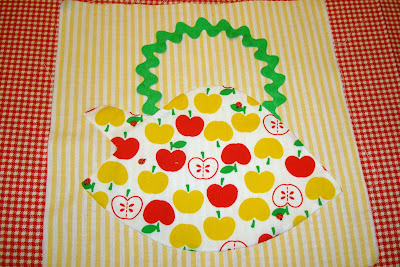 Then look at the appliqued teapot in contrast to the light teapot/teacup print. Not enough contrast. Even though both are very fun to look at, the teapot melts into the back ground print because of lack of contrast. Oh well. I like it anyway I guess. I wanted to use this really sweet teapot/teacup print Terri gave me but I should have waited to use a different fabric with it for the appliqued teapot. I still have more of the print though so I can easily make another block. I like the contrast of the pink dot with the teapot and I do like the overall teapot shape. That handle was a killer though. I'm not good with very narrow applique. I do really like the vintage button for the top of the lid. I've been experimenting with "tea" themed projects for the "Time for Tea" swap hosted by Stephanie. 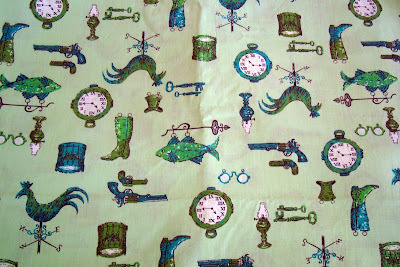 It is Friday so I want to show some of my fun and fabulous fabric, of course. 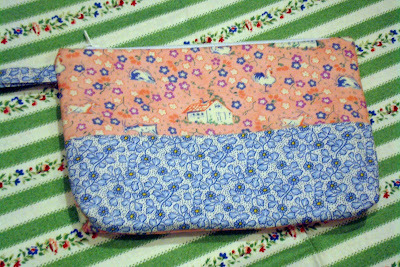 First off note the cute pink Japanese bee fabric in the background that Jane sent me. Thank you Jane. It is perfect for me. Sandi surprised me this week with some valentine prints that I plan on using to make more quilted valentines. Thank you Sandi. Both are such thoughtful people. 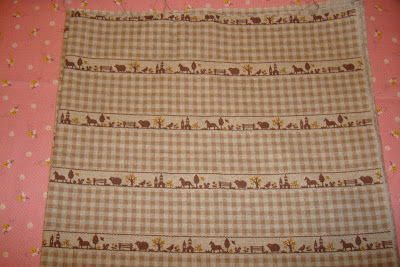 I like this check with brown/yellows that I pulled it off my shelf to think about making a teapot with. 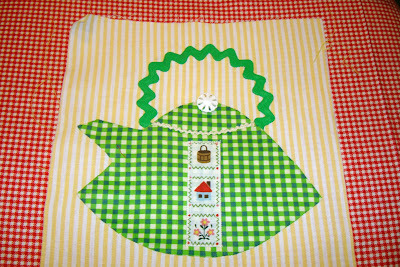 I'm not sure if I will use my own teapot applique from above or Pink Penguin's paper pieced teapot she posted this week. I'm always rather afraid of paper piecing but I will definitely make it anyway. If you haven't seen it - go look at it. It is fantastic. 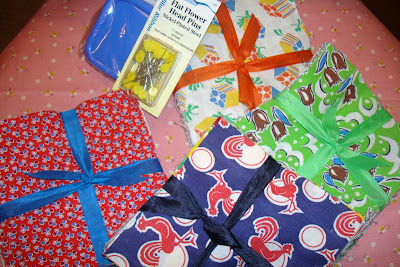 Above are some feed sack blocks ordered from Glenna. I could show them all to you but we'd be here all day. Take my word for it - they abound in fabulous vintageness. 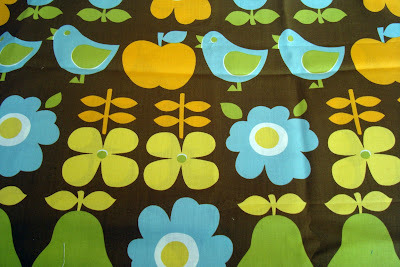 Glenna has a great selection of fabrics. 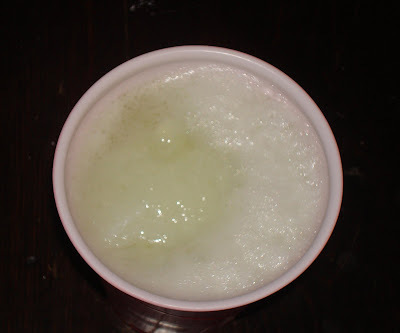 She showed us her stash on her blog recently and I was totally wowed. She has fabric heaven at her house. Sigh. Check my side bar or click this link for my free Valentine pattern - Last year in January I gave out a free pattern to my readers. 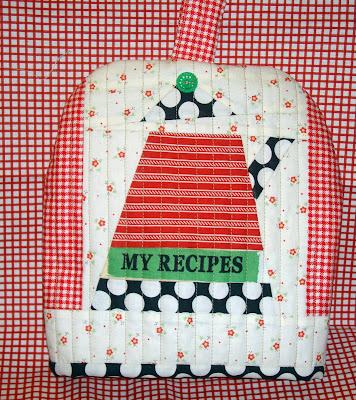 It was featured on Fat Quarter Shop's Jolly Jabber and also Sew Mama Sew carried the link to my pattern in January 2008. I have so many new readers of our blog that I thought I'd go back and review. This valentine pattern is one of the first designs I drew up several years ago. 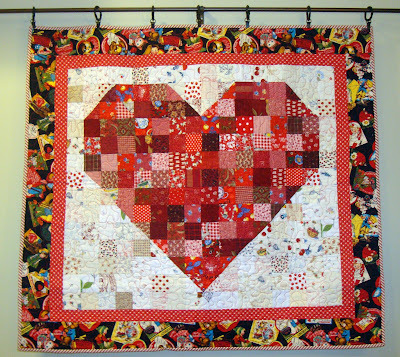 The shape of a heart is so simple and pleasing and I wanted a way to use lots of my fabric scraps. This is what I came up with. 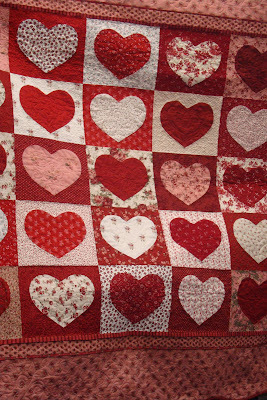 I love visiting the different fabrics every time I look at the hearts. There is just so much for the eye to enjoy. Above is a different version putting two sets of the hearts together to make four. I enjoy being able to use novelty valentine fabric, too. And when a project is this small, it is quick to whip up and simple to machine quilt even for the beginner. 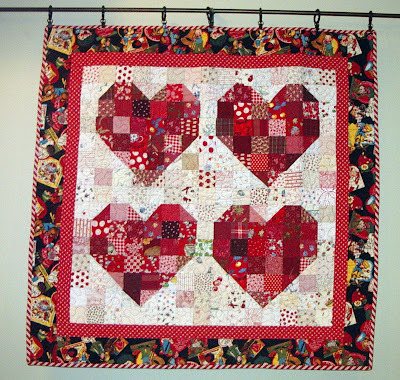 I have one big heart hanging in my sewing room right now. I have to confess it has been here since December 26. We take our Christmas decorations down on Boxing Day and up go the valentine decorations. After all, there is only 49 days in between Christmas and Valentine's Day to celebrate the love of hearts! 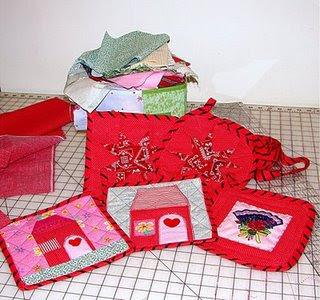 And if you are into a smaller project, you could make the Doll House pattern into Valentine pot holders, or just valentines. I swiped this pic from Posh and Trendy after she told me that she made valentine themed pot holdrs. I love how she quilted them, too. 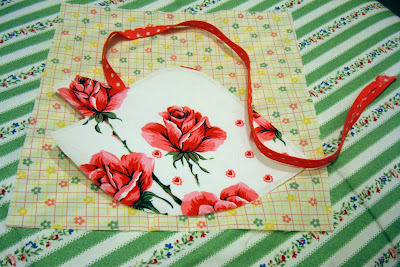 I've been going to make some valentine pot holders from the Doll House tutorial but Posh and Trendy beat me to it! Good for her. 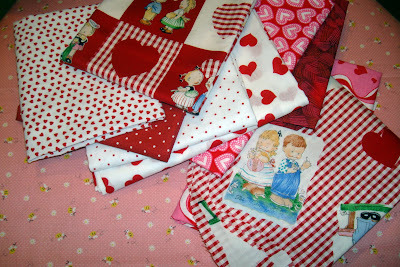 Sandi sent me some valentine fabric yesterday so I'll definately be making more heart themed projects. Thanks Sandi. In honor of the Inaugural Balls taking place tonight I thought I'd post my Ball Gown feed sack. 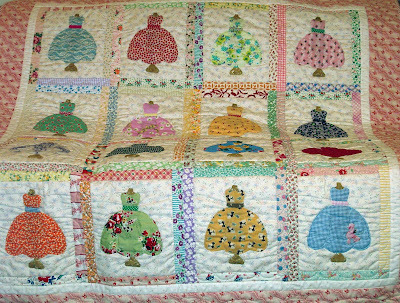 And also my ball gown quilt I made several years ago. 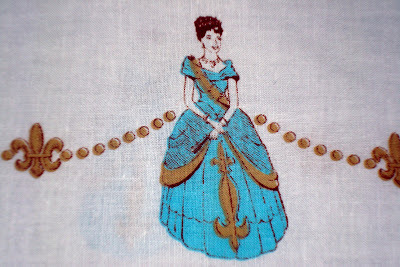 When I first saw this feed sack fabric I thought "Nancy Reagan" but after a while I realized it was probably the Queen of England? I think the fabric has to be older than when Nancy Reagan was first lady. Does anyone know when this feed sack was made and what it was made to commemorate? Glenna do you know? Or is it simply a lady in a ball gown and crown? It can't be Miss America can it? Whatever it is I really like it. 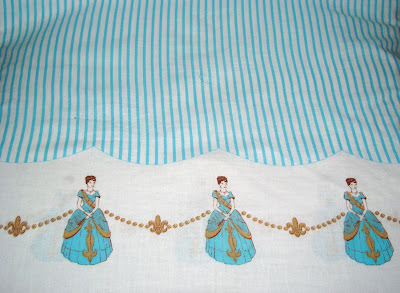 I especially like the blue stripes going into the white in a scalloped edge. And the blue stripe itself is very nice. I am sure when the time comes I will use every inch of this feed sack. It is unusual and fun. Don't you just love it? Edit - The concensus of those who "know" including Glenna and Sandi say that this is fabric commemorating the coronation of Queen Elizabeth in the '50s. I think that makes it pretty special fabric! And 'Posh and Trendy' pointed out it is very Jackie Kennedyesque, as well. 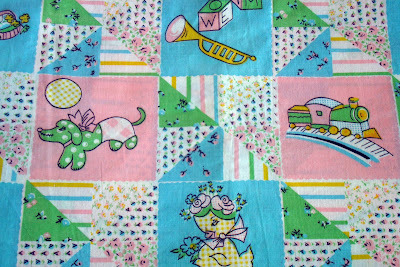 This was actually one of my first applique quilts and you can tell, eek don't look too closely. I guess it is okay because I've made progress. I do really love this ball gown quilt. I can't remember for sure but I think the purple fabric above is vintage. The funnest part was picking out fabric and deciding what to use. 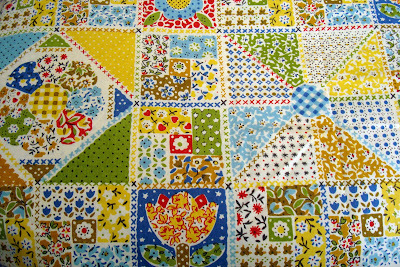 The pattern is from a quilt by Teri Christopherson in the book she made with her sister Barbara, called "Quilting with my Sister". 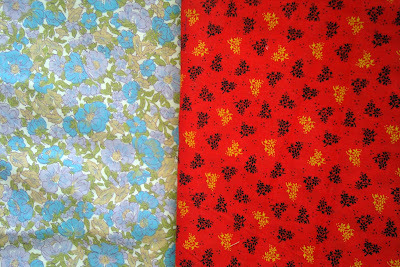 This dress in the green and turquoise is definately from vintage fabric. I sure wish I had more of that fabric. 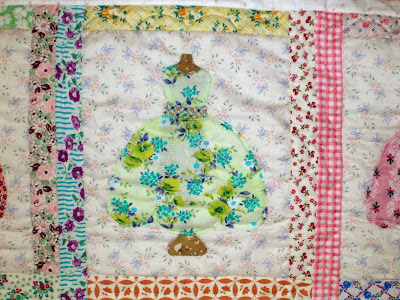 Dress quilts are my favorite. Obviously. I had a very productive weekend and I'm so proud of it that I'm just going to take a few moments to wallow in it. I'm asking forgiveness in advance. 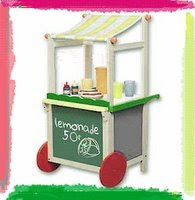 A huge huge thanks to Cheryl for getting the post for 2009 Handmade Christmas List updated. I couldn't have done it without you Cheryl ! You can refer to the original post for the update. Although the official deadline is past to submit we can still update with new items throughout the year here and there as I'm sure there will be things we don't want to forget that are great Christmas gift and ornament ideas. I'm just thrilled to be up to date with this. Sherri sent me this amazing zipper bag she made as a gift to me. Sherri's technique is perfection. I'm thinking of all kinds of cute things I can keep in it. Thank you so much Sherri. Our packages passed in the mail I think. Sherri and I (along with many others) are counting the days until our retreat next month. Christine showed the bag she made from a kit she bought at my Etsy Store on her blog. It turned out so darling. Christine you did a lovely job. Pam (PKM), Rae Ann and Annette showed their very sweet pot holders made with my Doll House Tutorial. I'm always so proud to see one of my designs all sewn together. 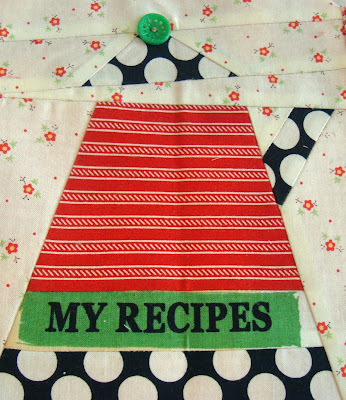 Would it be bragging to say my Doll House Pot Holder Tutorial was featured on Whip Up and One Pretty Thing? Thought so. Sorry. Speaking of - I finished a few more this weekend and I've got a several to go before I'm done making them (for now). It is too fun to stop. Anyone else making the these (or someone I forgot?) 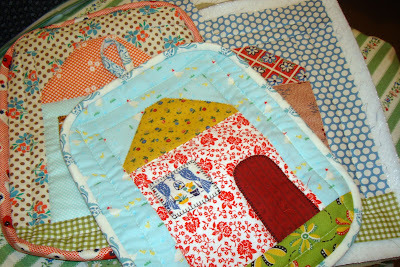 send me your pictures or links when you sew the Doll House pot holder and I'll post it. I love seeing them. Thanks to Shari, Mel , and Iluvbnamom for the sweet blog awards they gave to me in the past few days. I'm so blessed to enjoy such a talented group of women to associate and share ideas with. Thank you. Mr. Hive is at loose ends these days and when I told him about Elaine's recipe for laundry detergent he was up for making it. Thanks for the recipe Elaine. We did our first load and the clothes came out clean and bright. I couldn't post about it without a pic. So here is what it looks like (not an exciting picture). We poured it into an empty Tide container to use. I'm fairly happy about not spending $15.00 on a container of Tide. I started a new project this weekend. I've been wanting to make a teapot applique in a chunky shape. I cut out a few over the weekend but I haven't had a chance to put needle to fabric yet. And no, this is not for my tea swap partner. But you never know, if it works out I might use this on "something else". 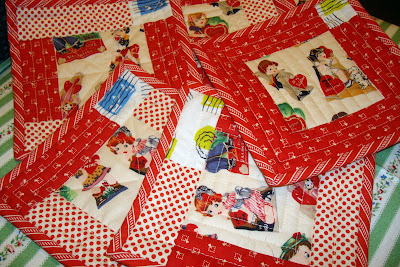 And continuing with an ongoing project - my quilted valentines are growing in number. I made 10 over the weekend and now I'm binding them. I love the mini quilt/card idea. Last but not least is the most exciting news. Don't you hate when someone complains about a problem and then doesn't do anything about it??? Well I've been complaining about my Google Reader list of over 500 posts to read. Jane had me convinced to just close my eyes and click "all read". I tried to do it but couldn't. This weekend I blocked out some time and read EVERY POST. I may not have commented on all over them but I did look at/read them all. It was the best feeling to get this done. When I got to under 100, my pulse quickened and I felt like I was winning some competition! I know, I'm very competitive. Next I tackle my e-mail. My inbox is very fat these days. I told you today was an incredible Friday for fabric. A huge thank-you to Lori, a reader of our blog. 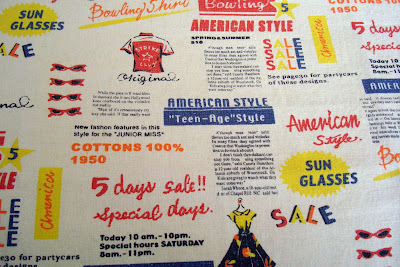 Lori sent me an incredible box of vintage fabric this week. I could hardly believe her generosity and my fortune in having this very sweet and thoughtful box come to me! 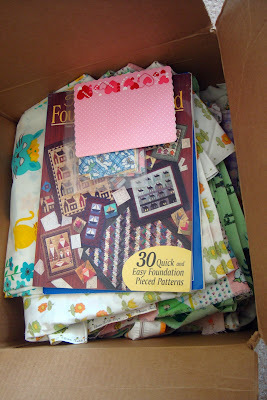 Here is a picture of what opening the box looked like - a vintage fabric lover's dream! 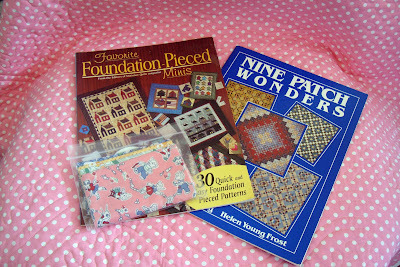 I love vintage quilt books. These two have great ideas. And a little charm pack! How cute are these! 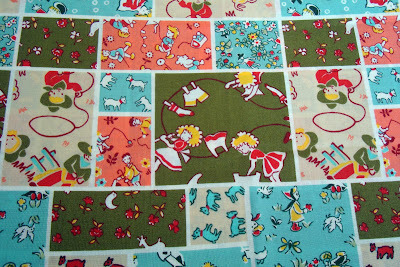 There are yards and yards of this fabric. I was glad because it is my favorite of the lot. I can think of so many uses for this and I'm very into those colors right now. 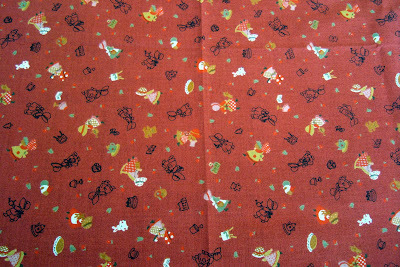 Charming juvenile novelty fabric - looks like some of the new Japanese fabrics they are making. So cute. 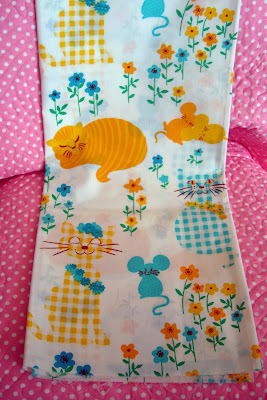 The scale of this juvenile novelty fabric is wonderful. This is something I will definitely put in my next baby quilt. Mushrooms are all the rage now. Everything old is new again! 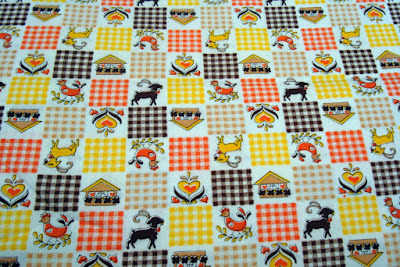 Seersucker, gingham and flocked gingham. I feel like I've gone into my my mom's sewing room shelves from when I was a kid. I love roses. 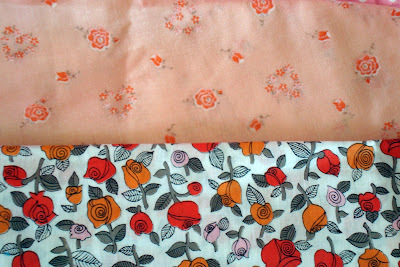 Aren't these two vintage rose prints wonderful. Very beautiful. This purple and blue one reminds me of some fabric Eileen used in her owls this Christmas. And the red could be used for so many things. Isn't this kitchen novelty great? I love the green and blue together and the watches and things are so fun. Guns even! Thank you again Lori. 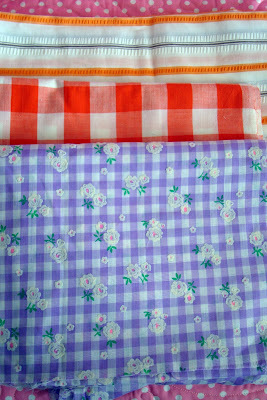 I am very excited to have these fabrics and I will put them to use and think of your thoughtfulness when I use them! Isn't that so nice of her. Happy weekend everyone. Edit - I forgot to mention Teresa's giveaway. Go say hi to her.